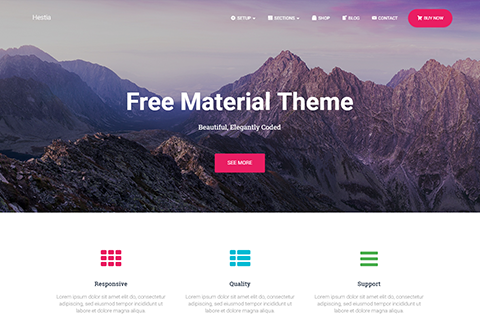 Hestia a Free Material Design WordPress theme for Business and Startup Websites. Hestia is a Free material design WordPress theme best suited for business and startup websites. It comes with a beautiful and modern interface, built on a one-page layout. The theme is a perfect fit for both corporate and creative purposes, as it provides a clean and flexible appearance, an elegant portfolio, and a catchy online shop built with WooCommerce or EasyDigitalDownloads. Hestia is a fully responsive design that always remains mobile-friendly and will render perfectly on all devices. If you want to create awesome-looking content quickly, what you need is a top-of-the-line drag-and-drop content builder. It just so happens that Hestia comes fully compatible with SiteOrigin Page Builder – the best free solution around.